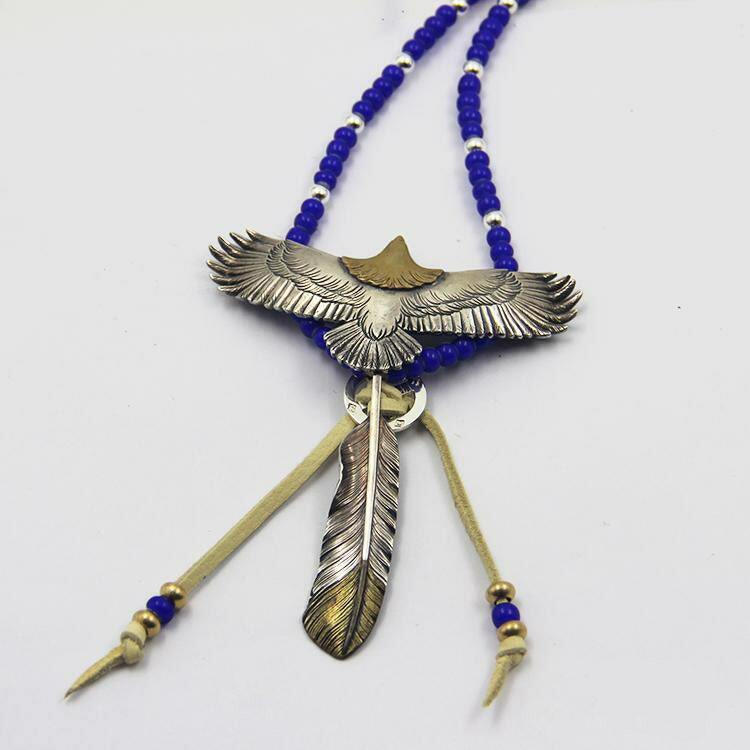 The silver eagle necklace is not for the faint of heart. 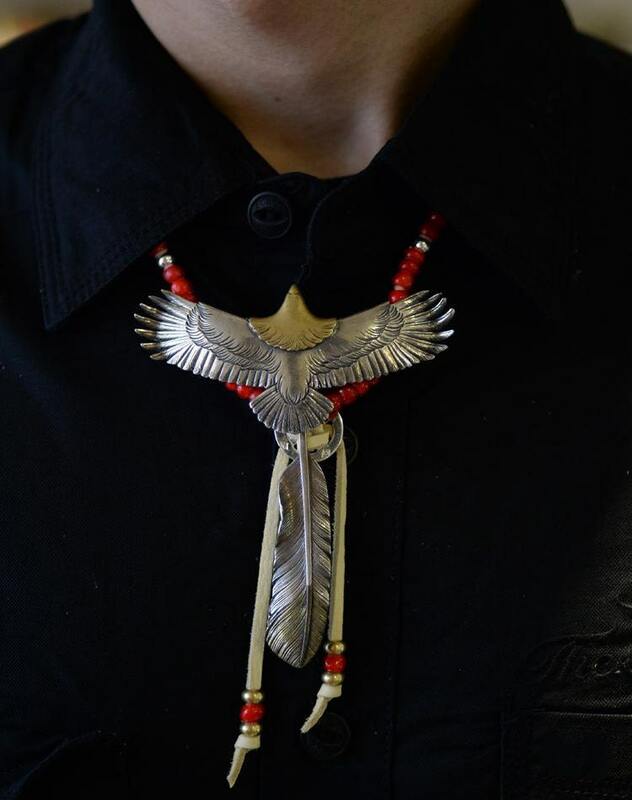 No way you can wear this Native American inspired design AND stay unnoticed. So, think carefully before you buy. A centerpiece bald eagle charm - crafted in 18K gold and silver. It is carved in incredible detail - look at the wings, the gently curving wing tips, the realistic eagle head. Then there is the feather charm - featuring a large silver and gold feather, attached to a peace sign charm. The feather is also available in silver and brass combination. 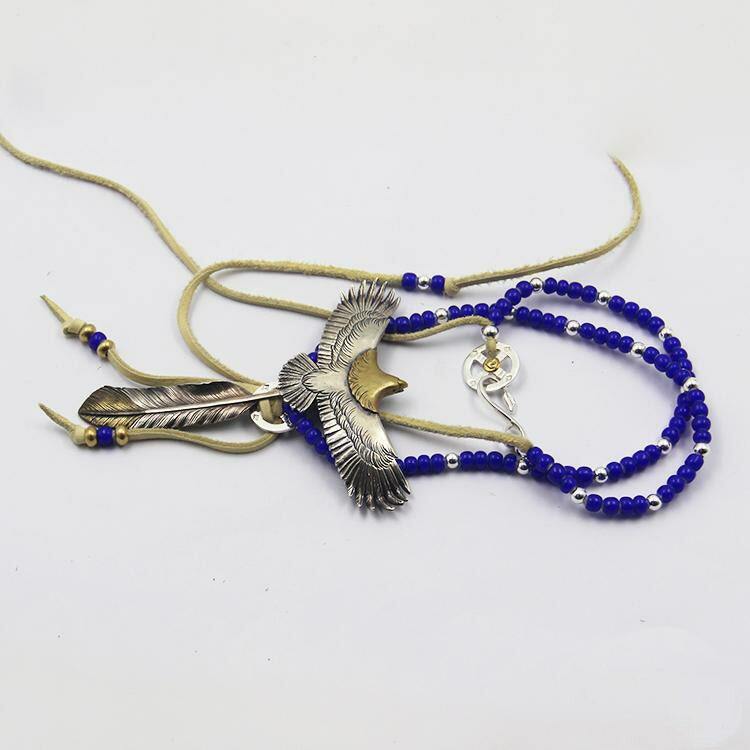 The eagle and feather charms hang over a beaded necklace - crafted in Czech glass beads and silver beads. The beads are available in a two color choices - red and blue. 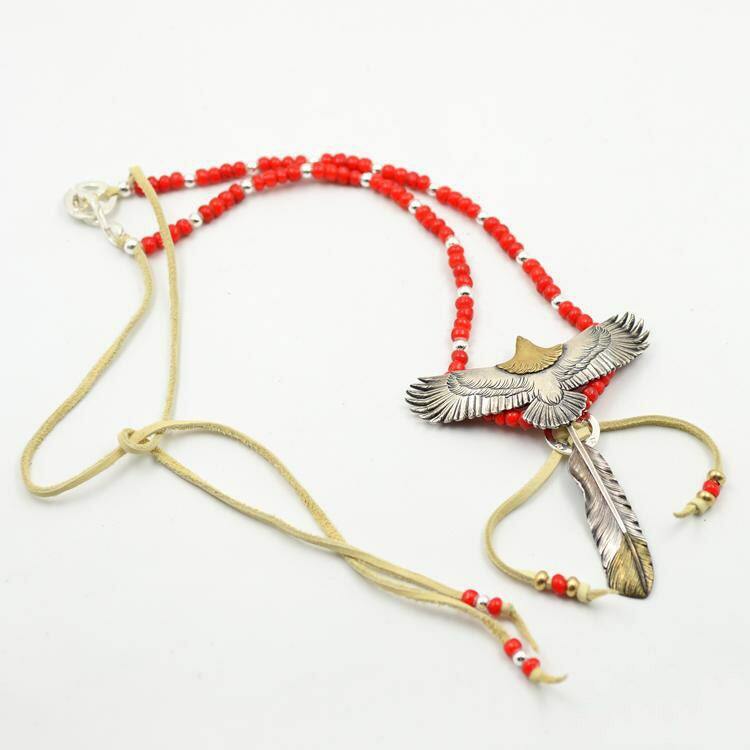 The beads are strung through a sturdy and durable deer leather string. 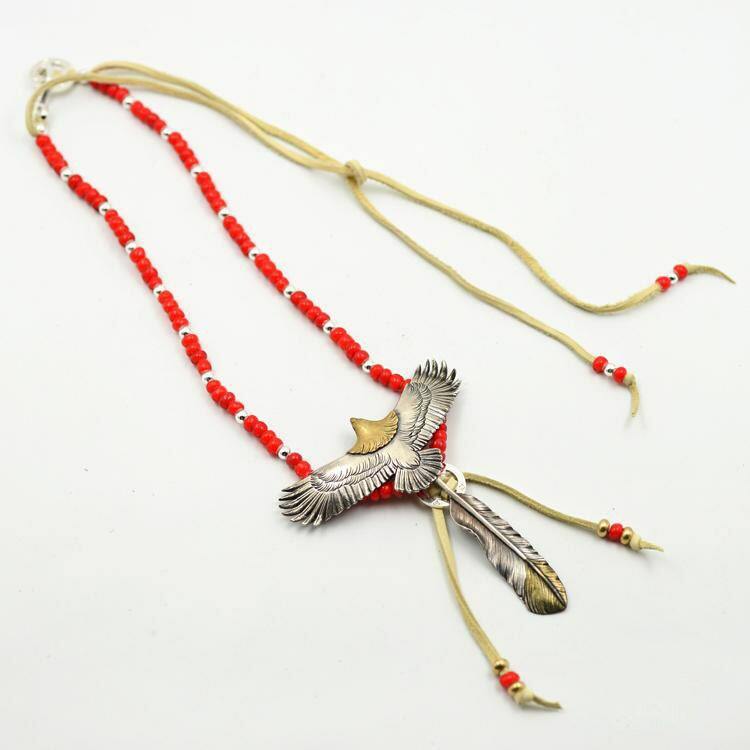 The deer leather string is extra length, and overhangs liberally over the sides, and decorated with extra beads at the ends. This adds an element of extravagant, carefree look to the necklace. Another cross charm forms the necklace closure - together with a large hook carved in the shape of an eagle head. Note: The model in the above image is wearing a 45cm/17.7inch necklace. The yellow part on the eagle head we only make 18K Solid Gold. For the yellow part on the feather pendant, you can choose either Brass or 18K gold. 925 sterling silver, 18K gold, brass (optional), Czech glass beads, deer leather. The silver eagle pendant and feather pendant are available in two finishes - the original, shiny silver finish, and an oxidized, vintage finish.